Silver Granite Setts are suitable for edging driveways and paths. 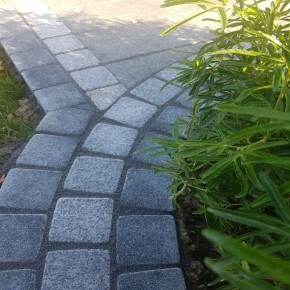 Available in Silver Grey and Black colour, Granite Setts are Ideal for driveways, paths and edging. The pack gives 8 m2 coverage of 100x100 size setts. Silver Granite Setts Pavers are of 100x100 in size with a thickness of 50-70mm thick. With this stunning Cobbles create an absolutely stunning edging for patio paving & pathways. Our Natural Stone is high quality for your Patios, Garden Paving and Landscaping Projects from Direct Importers. All our products are suitable for British Weather conditions and they are frost resistant. We can also do Split Packs to match you exact meterage so you don't need to order extra and waste it - Split Pack Fee Applies*.